as random as i will ever be. it was raining like crazy this afternoon, i figured i just need to have a lil' shoot. 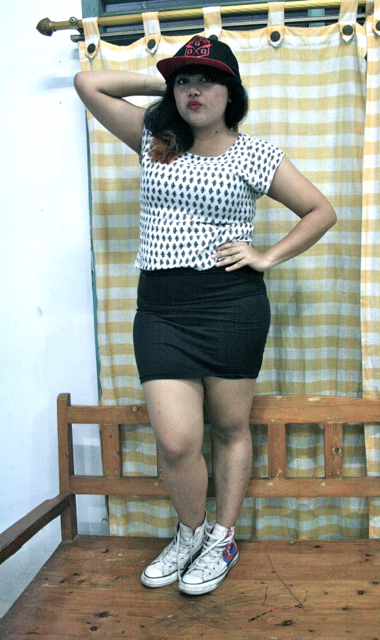 so i assembled this random fan printed top and this bandage skirt. put my snapback on, and then grabbed my converse. a simple well-put-together outfit for running errands. lately i have been so drained. don't know how, don't know why. it's just as soon as i get home, i just see my bed and just went .... fainted. that's why i chose this slightly sporty look, coz i just need to be fit to face the end of the semester. junior year, 5th semester, third year. i am swimming in papers and finals.